- It is quite disheartening to see that political tensions wiped out a year worth of work. I am actually almost $10 K lower than was in December last year. The reason for this statement is one of the biggest losers in the portfolio is Gazprom. Fundamentally nothing changed in the company – same customer base, sales volumes, resource based, safety records, etc. - The year is not over as before calculating overall performance this year there is some dividends from S&P500 ETF and the emerging markets ETF, company shares. This will not have big impact but I still expect to have about $500 in dividends. 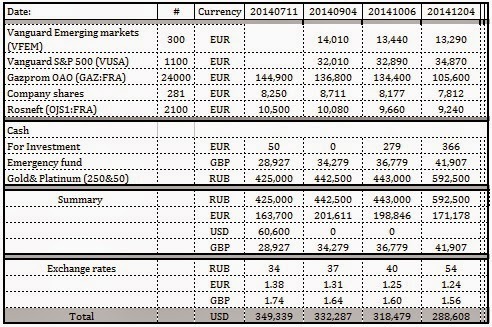 - As you could see for the last 6 months both EUR and GBP lost almost 10% towards USD. Which makes European stocks quite cheap but it is an indication of trouble. Inflation in Euro zone is almost 0% this year. The UK is struggling as well as all jobs added to the economy a low paid jobs, which does really help to recover the economy from the recession. - I have accumulated a significant cash sum but intended to stay cash in the short term. With the oil prices being low, 0% inflation in euro zone, slow growth in China I expect a market correction soon. This will happen for S&P500 as current investment in the stocks is NOT performance supported, i.e. dividends do not keep up with the share prices. Even US energy companies experienced correction of only 5% , while the rest of the world 10% and up. Oil industry borrowed billions dollars and it is starting to weight on banks, while Saudia Arabia and its Middle East supporters aiming to destroy shale oil production in the US. - Our company is re-introduced share incentives program but I will only find out the results sometime in January. This will coincide with end of the year review.